Each theme includes starting points on how to introduce the topic through whole-class games and activities, conversation models for speaking and listening practice, vocabulary lists and how to make the display. Many of the activities are cross-curricular and include aspects of history, geography, maths and, of course, art, design and ICT. 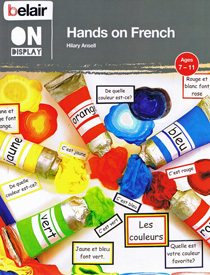 Hands on French has been developed for use with children in Key Stage Two (aged 7 -11) who are learning French, although the ideas in this book are easily adapted to suit younger or older beginners (e.g. KS1 / KS3). There is full support for non-specialist teachers.